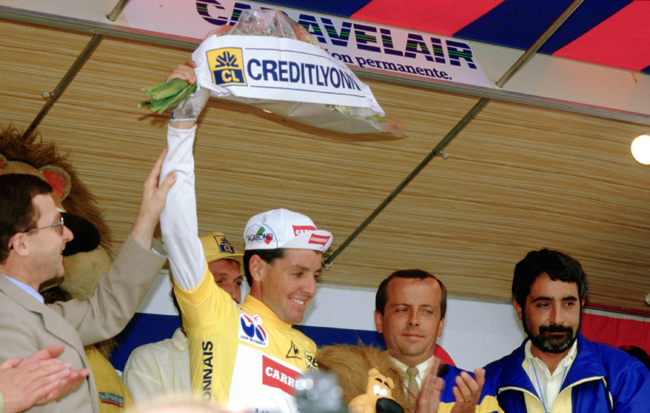 Stephen Roche (born November 28, 1959) was one of the modern age's most talented racers. One can only guess at what he could have done with a reliable and pain-free right knee. His 1987 season was stuff of legend with victories in the Giro d'Italia, Tour of Romandie, Tour de France and World Championships. The only other rider to win the "Triple Crown" (Giro, Tour, Worlds) is Eddy Merckx. Roche's first year as professional (1981) showed he was a complete rider with victories in Paris-Nice (beating the very formidable Adrie Van der Poel by 79 seconds) and the Grand Prix des Nations, then the unofficial world time trial championship. His upward march was stopped dead in its tracks when he crashed in the 1986 Paris Six-Day. The damage to his right knee would haunt him the remainder of his career. By early 1987 surgery had stabilized the knee enough to allow him to resume racing at a high level. And race at a high level he did. With early season wins that included a third Tour of Romandie win he went into the 1987 Giro d'Italia sharing team leadership with 1986 Giro winner Roberto Visentini. Roche and Visentini did not like each other and both wanted to win the Giro. After Roche faltered in the San Marino time trial Visentini became the maglia rosa. 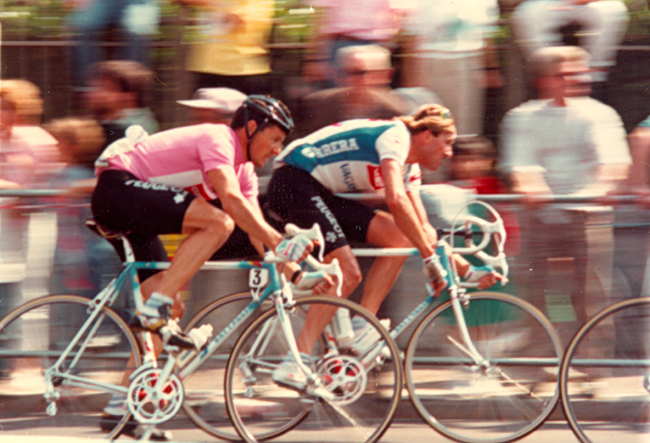 Two stages later Roche attacked Visentini against orders from his director, Davide Boifava. Defying Boifava, Roche persisted and at the end of the stage Roche was again in pink while Visentini's morale was completely broken. Italy's fans were livid. 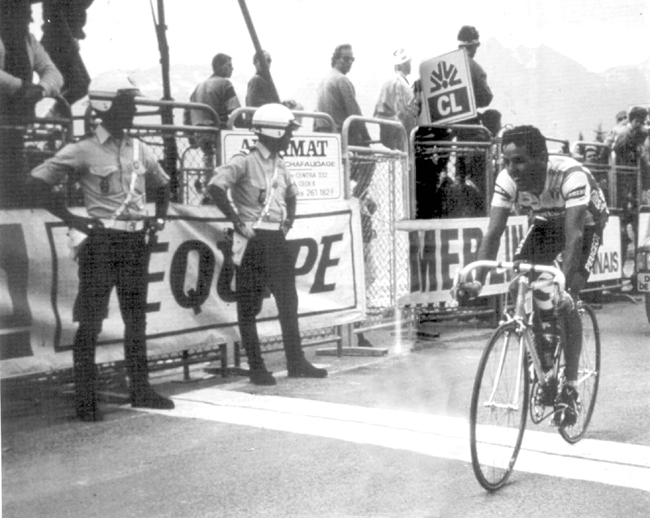 Despite threats from Visentini and Italy's tifosi Roche won the Giro. At the Tour de France Roche fought a brilliant battle with Pedro Delgado, Delgado being the better climber, Roche the superior time trialist. And that's how it played out. Going into the final time trial Delgado led Roche by 21 seconds. Roche's second place in that time trial put him in yellow for good. At the world championships Roche took off on a successful a late flyer, beating Moreno Argentin by a single second. That made him the second rider in cycling history to win the triple crown. But Roche would not be able to win races in his rainbow jersey. His knee blew up, ruining his 1988 season. From then on, despite several attempts to repair the knee he was never again a contender for a Grand Tour victory. Roche retired in 1993. 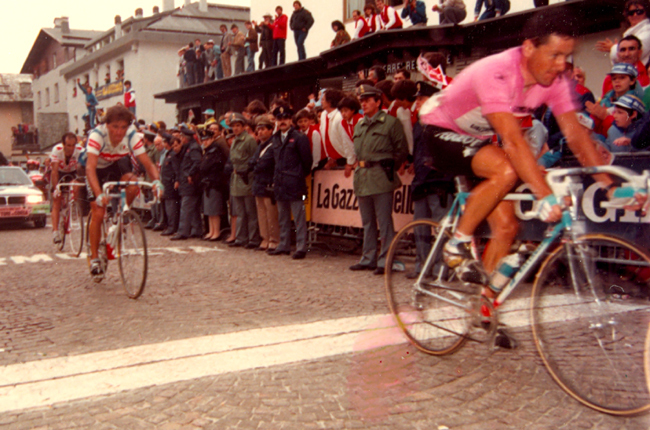 Roche climbs in the 1981 Giro di Lombardia. 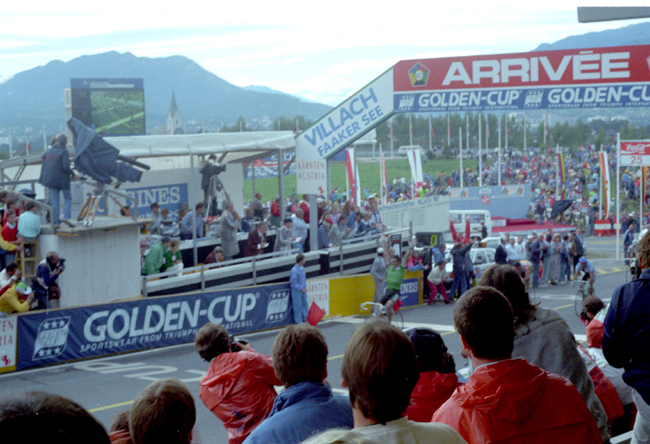 Roche rides stage 15 of the 1984 Tour de France. 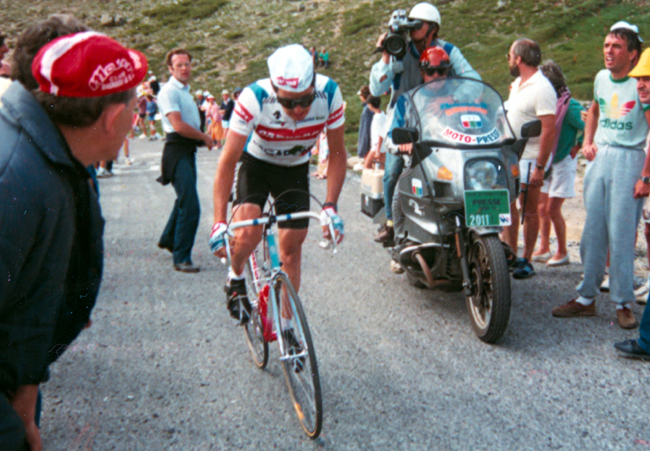 1986 Tour de France, stage 16: Roche climbs to Serre Chevalier. 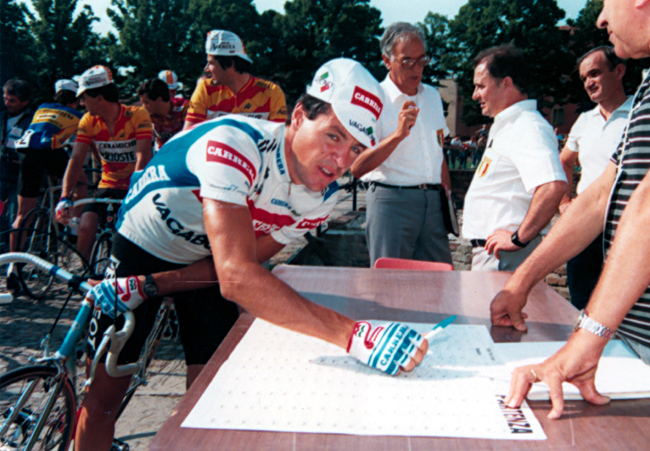 Roche signs in at the 1986 Coppa Placci. 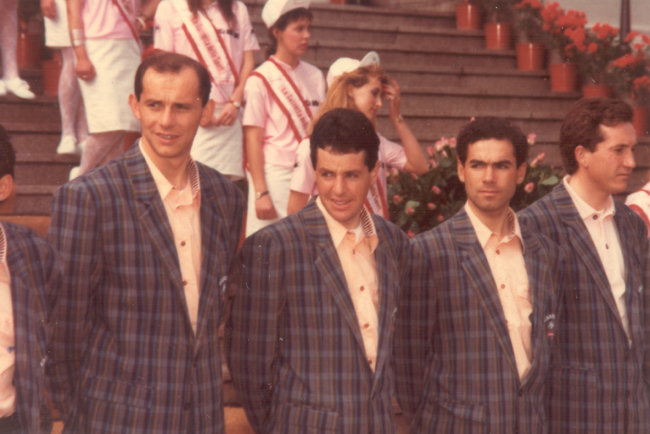 Roche (second from left) at the 1987 Giro teams presentation. 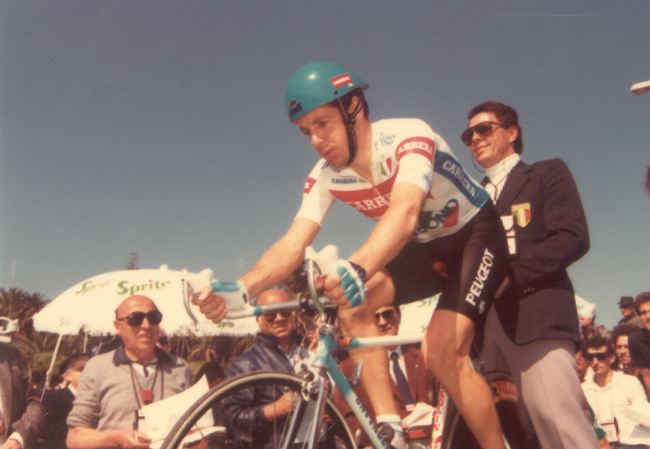 Roche ready to ride the 1987 Giro prologue. 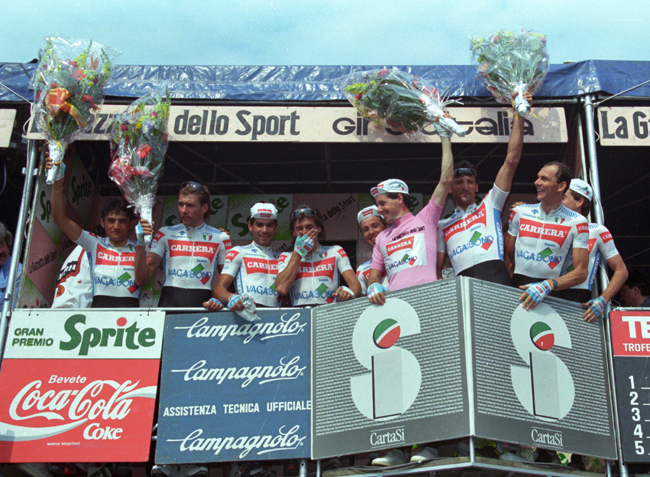 After the stage 3 time trial of the 1987 Giro d'Italia Roche is in pink. 1987 Giro d'Italia stage 13: Roche riding the San Marino Time trial, doing badly enough to lose the lead to teammate Roberto Visentini. 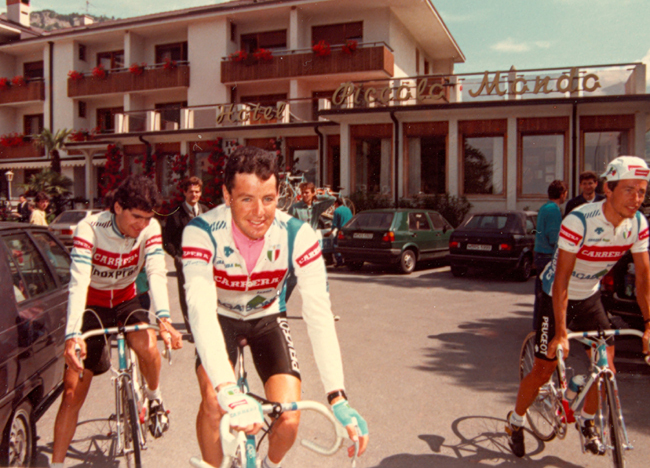 Back in pink: Roche at stage 18 of the 1987 Giro d'Italia. 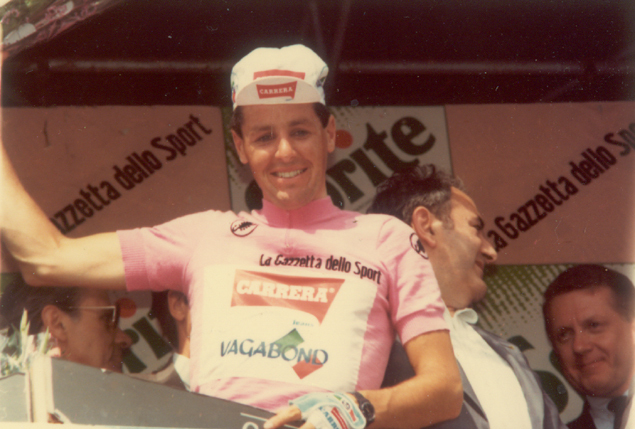 Roche enjoys time on the podium of the 1987 Giro d'Italia. 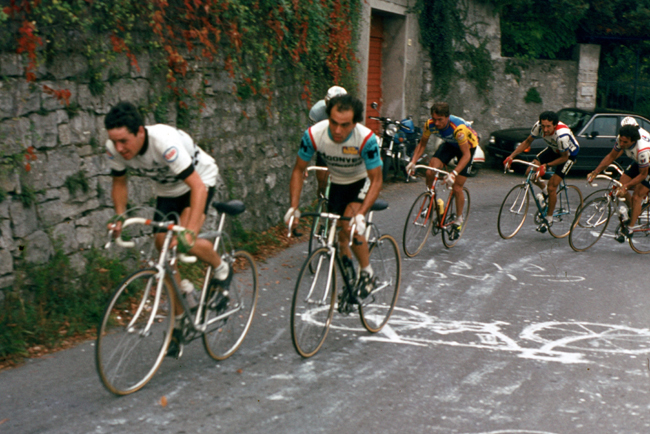 1987 Giro d'Italia, stage 19. Roche finishes 7th with Roberto Visentini right on his wheel. 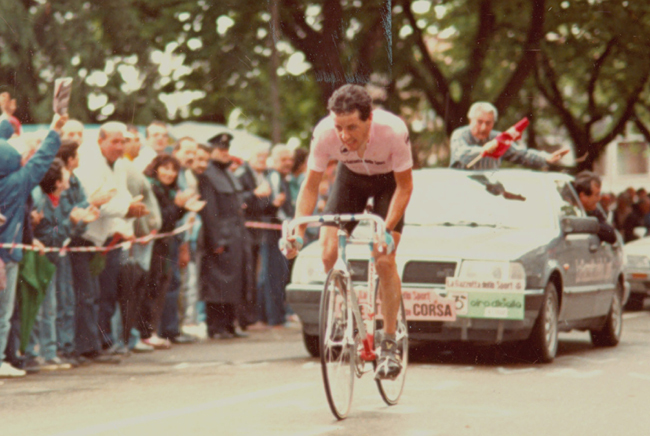 Roche rides the 20th stage of the 1987 Giro d'Italia. 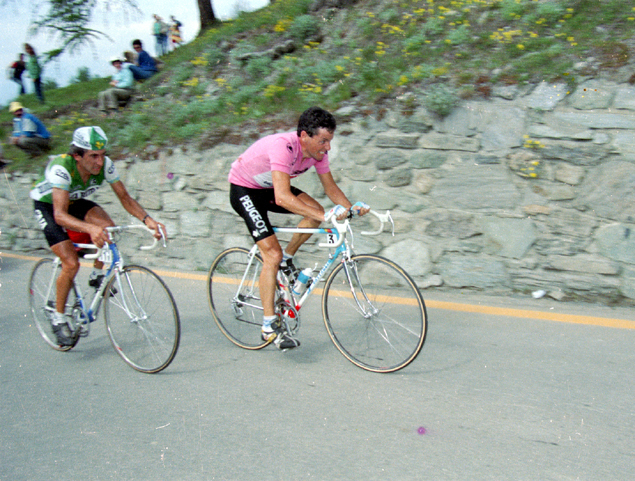 Stephen Roche riding to Pila in the 1987 Giro d'Italia's 21st stage. 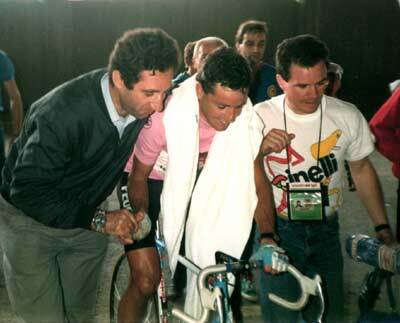 Celestino Vercelli (owner of Vittoria shoes and one of Roche's sponsors) with Roche after a stage in the 1987 Giro. Roche seals the deal. 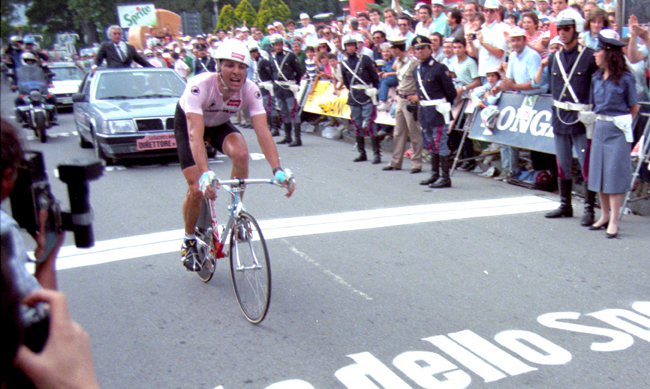 He wins the final time trial stage and the 1987 Giro d'Italia. 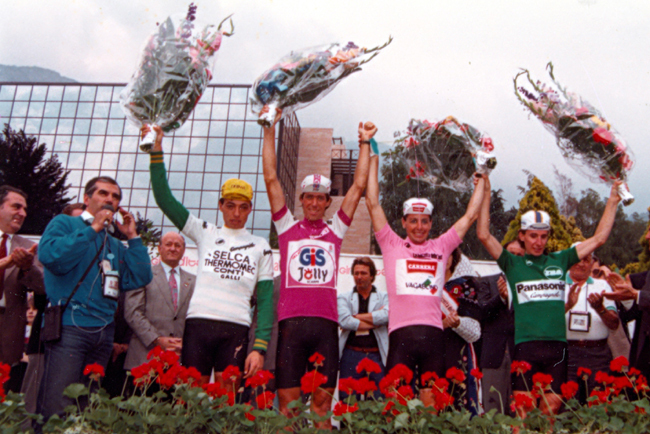 1987 Giro d'Italia final classification winners, from left: White Jersey Roberto Conti, Purple Jersey Johan Van der Velde, Pink Jersey Sephen Roche and Green Jersey Robert Millar. 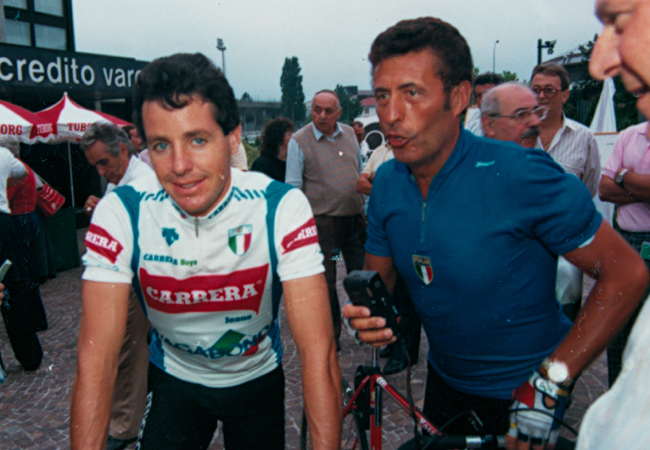 Roche with a fan at the 1987 Tre Valli Varesine. Roche riding to the top of Mt. 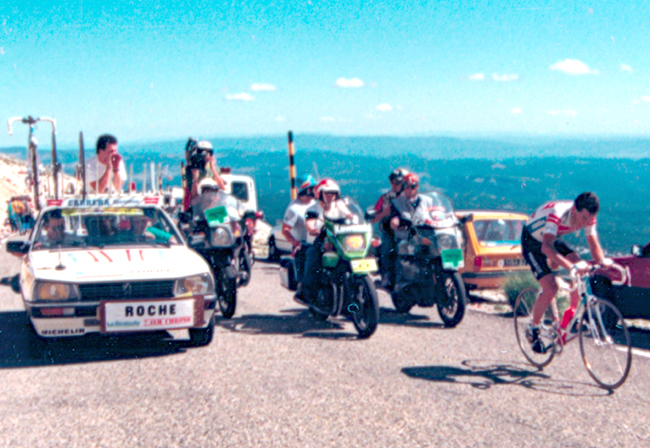 Ventoux in stage 18 of the 1987 Tour de France. 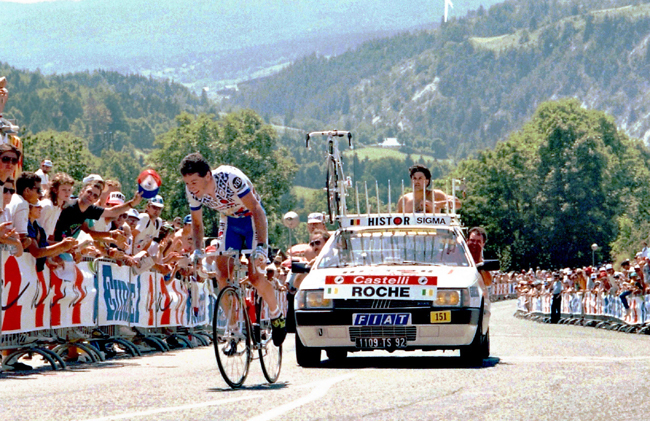 Roche has just taken the yellow jersey from Jean-François Bernard in stage 19 of the 1987 Tour de France. 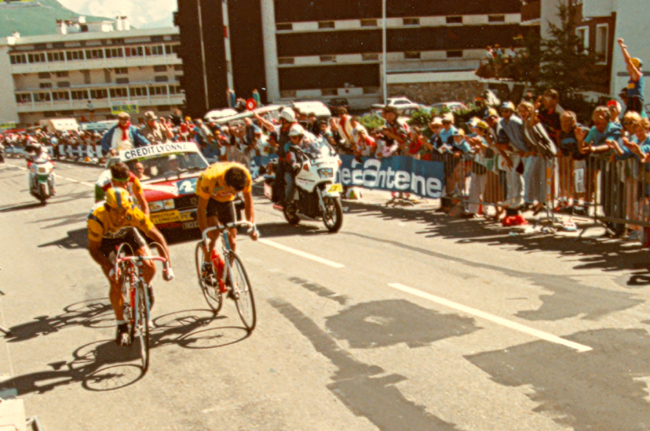 Roche (right, in yellow) losing the yellow jersey as he rides to l'Alpe d'Huez in the 1987 Tour de France. 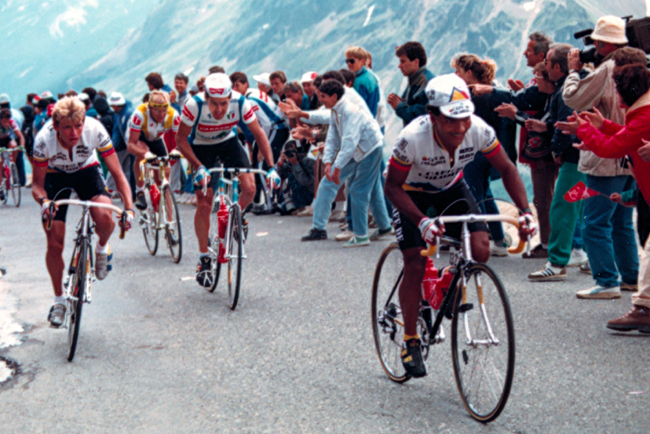 Roche (center) riding to La Plagne in the 1987 Tour de France. Laurent Fignon is on his wheel. 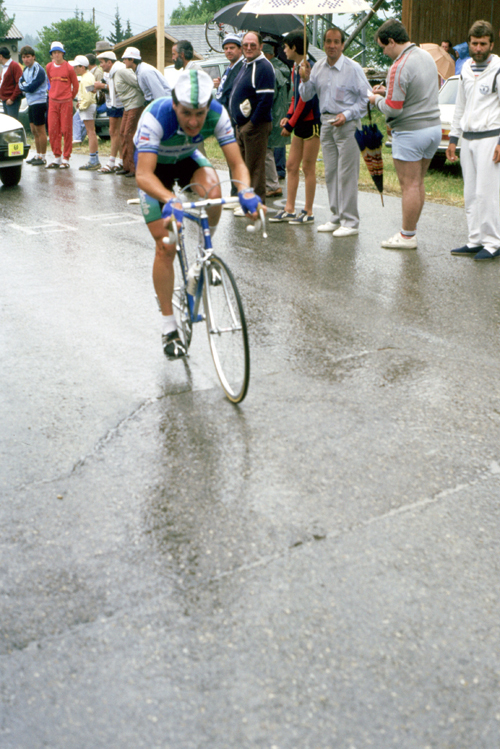 Stephen Roche wins the 1987 World Road Championships. 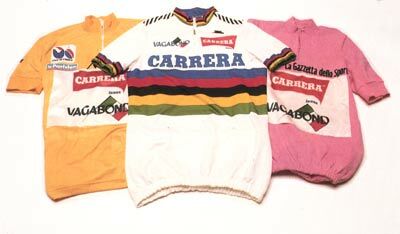 Roche's 1987 haul: Yellow, Pink and Rainbow jerseys. 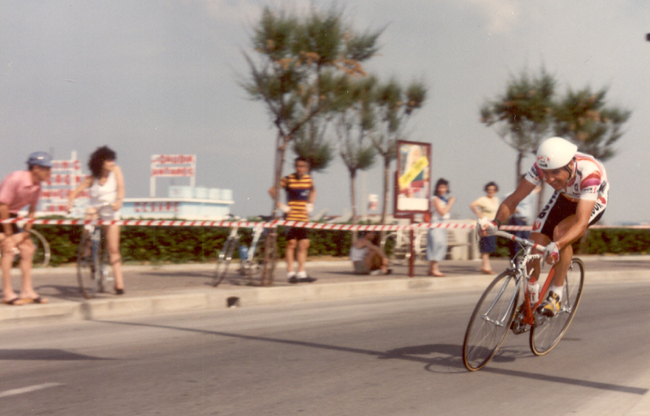 Roche riding the 1989 Giro d'Italia stage 10 time trial at Riccione. 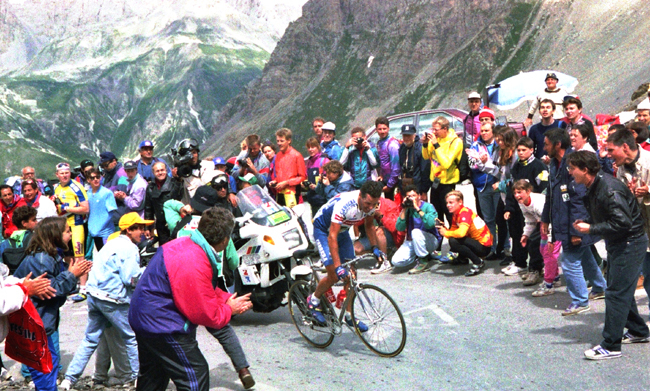 1990 Tour de France, stage 11: Stephen Roche time trials to Villard de Lans. 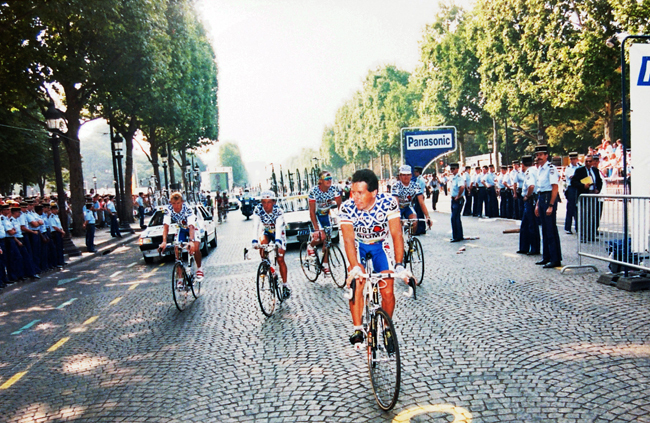 Roche with his Histor-Sigma team on the Champs Elysées in the 1990 Tour de France's final stage. 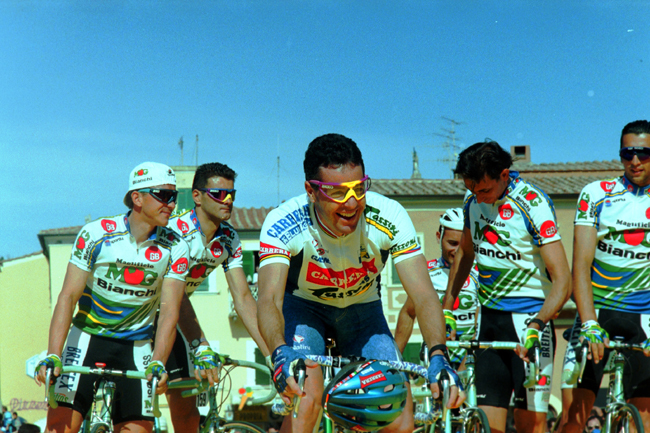 Stephen Roche at the start of the 1992 Milano-San Remo. 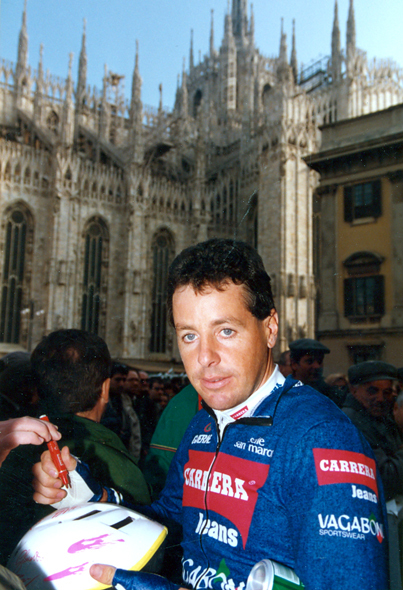 Stephen Roche at the 1993 Giro d'Italia teams presentation. 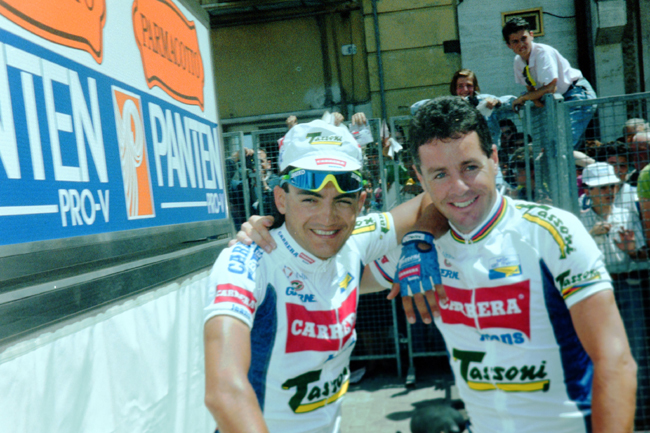 Stephen Roche with Claudio Chiappucci at the start of stage 3 of the 1993 Giro d'Italia. 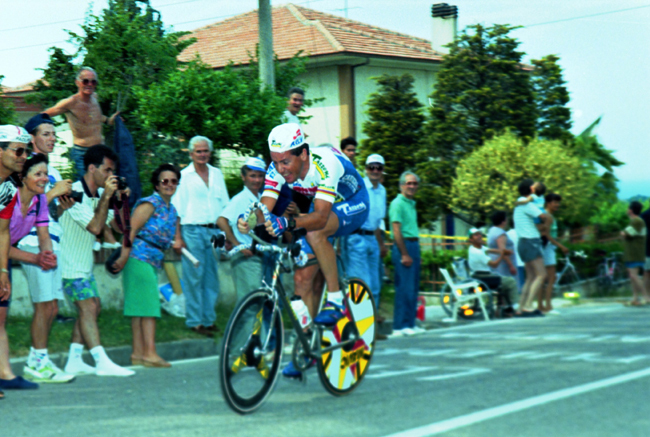 Roche riding against the clock in the 1993 Giro's 10th stage. 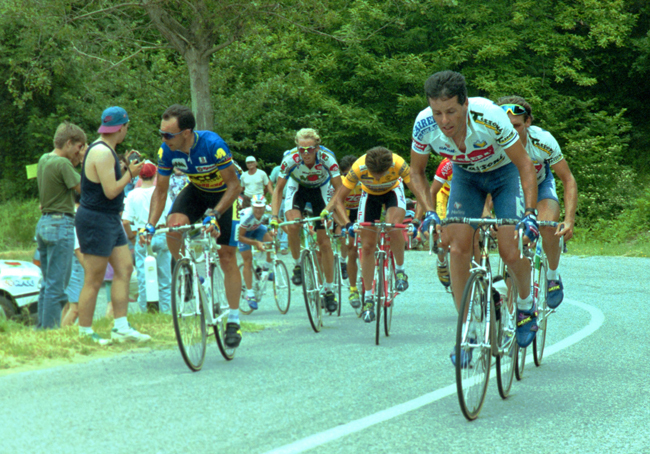 1993 Giro, stage 17: Roche (right) leads up the road to Valle Varaita. 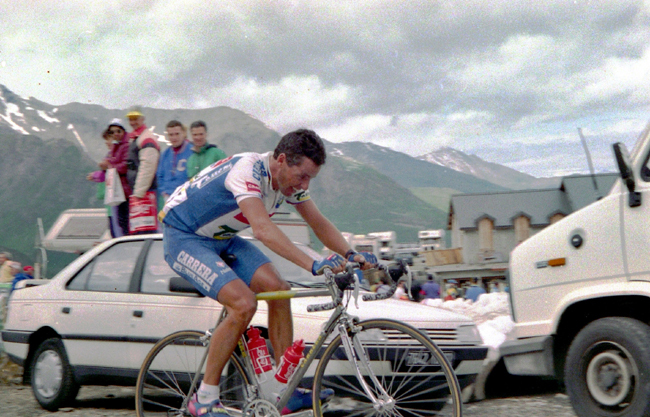 1993 Tour de France, stage 10: Stephen Roche rides to Serre Chevalier. Roche in the small ring in stage 11 of the 1993 Tour de France finishing at Isola 2000. 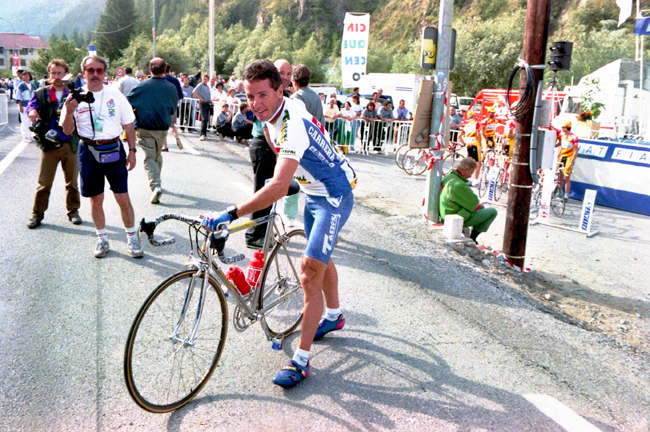 Looks like Stephen Roche is about to start stage 12 at Isola 2000 in the 1993 Tour de France. The Ariostea team (red and yellow kit) is behind him. 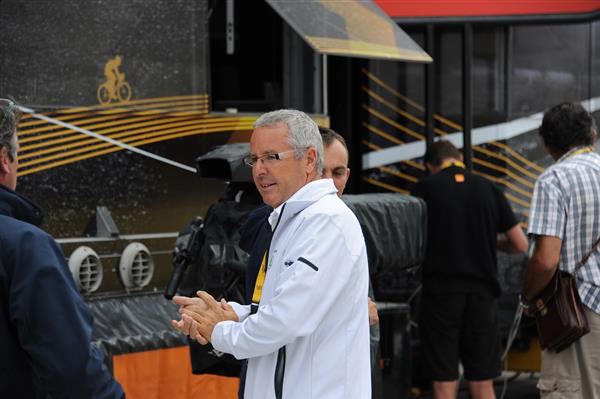 Stephen Roche at stage 15 of the 2013 Tour de France.